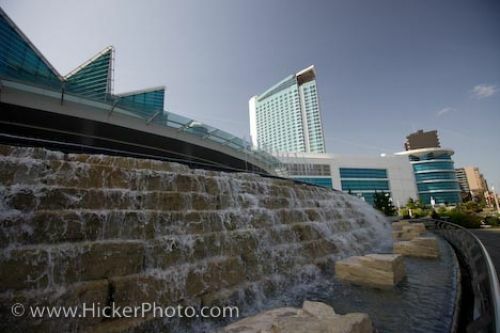 Water cascades over tiers to the base of the fountain outside Caesars Windsor Casino located in Windsor, Ontario in Canada. Built in 1998, Caesars Windsor Casino in Windsor, Ontario in Canada, stands 27 stories high bringing in millions of people every year, some coming from Michigan, Ohio and Illinois along with other places in the United States. Formerly known as Casino Windsor, the casino was expanded, remodeled and renamed to Caesars Windsor Casino in 2008. The expansions completed in 2008, opened a 5,000 seat entertainment area, an additional tower in the hotel, a large convention centre and constant renovations are always being done to upgrade the first area of the casino. Caesars Windsor Casino sits along the riverfront of Windsor with a spectacular view of the Detroit skyline and a massive fountain decorating the entranceway. Picture of the fountain outside Caesars Windsor, a beautiful casino located in the city of Windsor in Ontario, Canada.